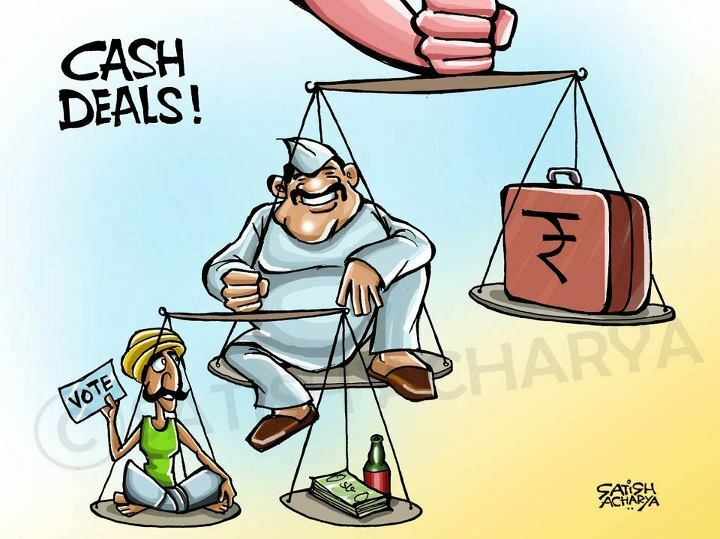 Cartoon on Cash deals. votes for money,liquor and sweets. Now a days elections are not elections they had become the cash deals between politicians, poor People and the government. The people are selling their votes just for the income of one day. The politicians in rural areas know that the people are not educated and they will agree to give them votes if they will pay them a little amount of money,liquor or some sweets. The situation is more drastic in the villages where there is a party for whole village a day before election. There should be an eye on the politicians so they don't even try to buy the votes as the votes are the only things which decides the future of the country. Saara khel corruption ka hai bhai. Yaa the main role is of corruption only. Politicians can give even 100% discount for once in return of a vote.